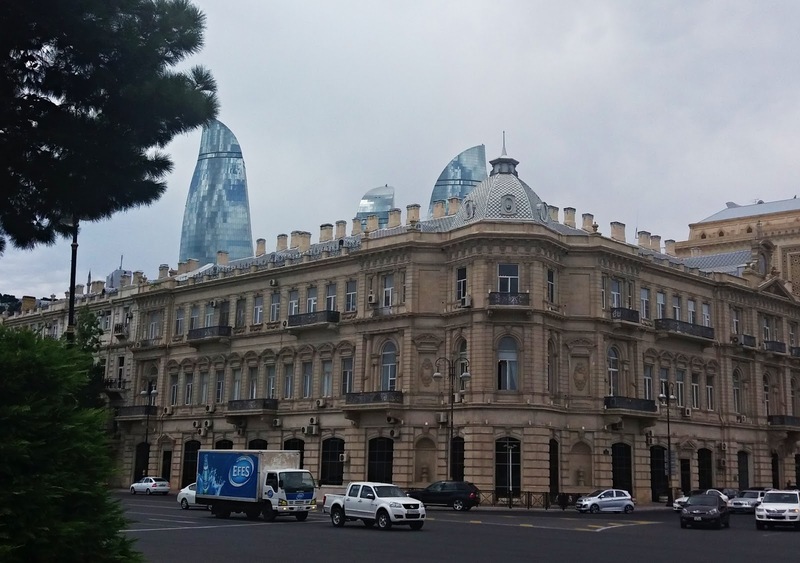 Baku is… different. Now this is not much of a statement if you don’t have my exact background, and judging by the fact you’re not me—you probably don’t. So, different to what, anyway? I don’t dare say “Europe” because Europe is just so diverse, but I’m thinking along those lines. Baku is just different. 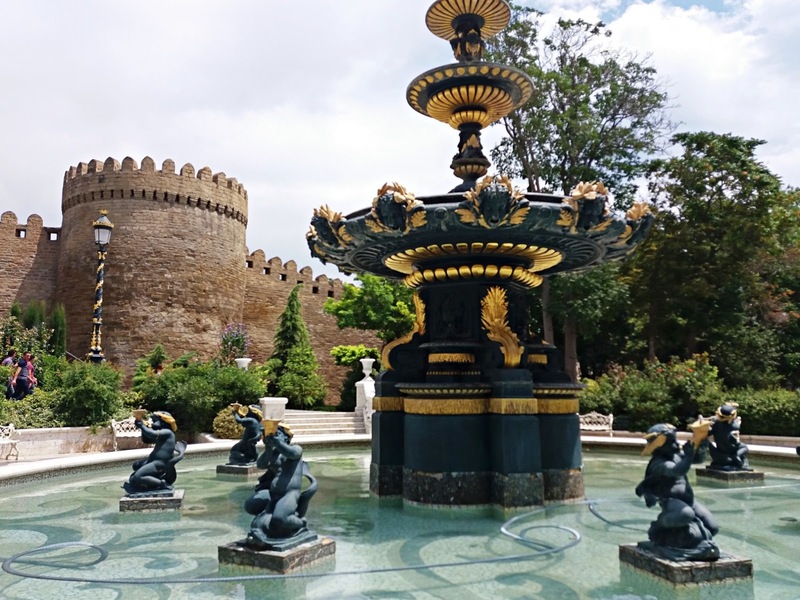 Baku, as you know already, is the capital of Azerbaijan, and the largest city in the Caucasus. It is a rich city, which is even more emphasized once you leave it and explore the country, which is on the poorer side. 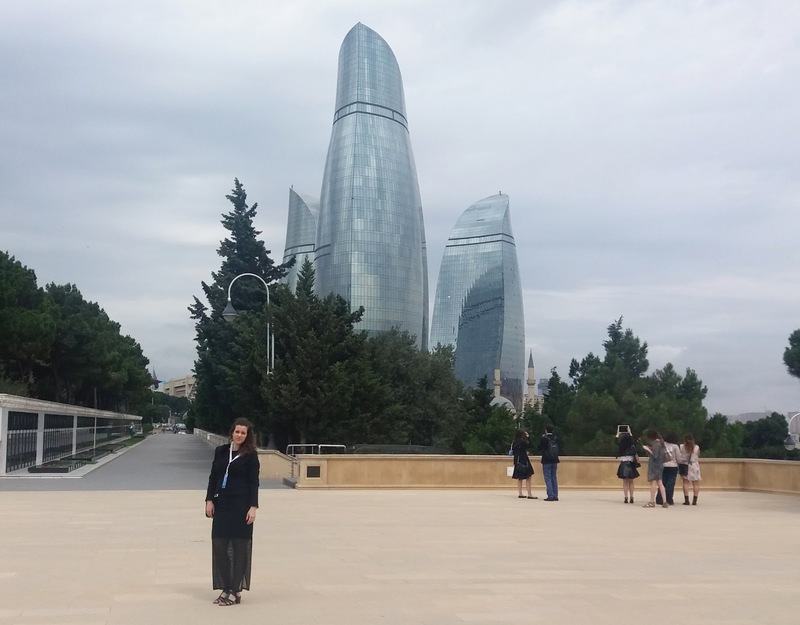 Baku is trying to establish itself by building great skyscrapers and being a modern metropolis. On the other side, I saw extremely poor neighborhoods not once. Still, even though this wasn’t exactly my favorite, I’m glad I visited Baku, especially because it is the home to one of the most beautiful buildings I have ever seen. 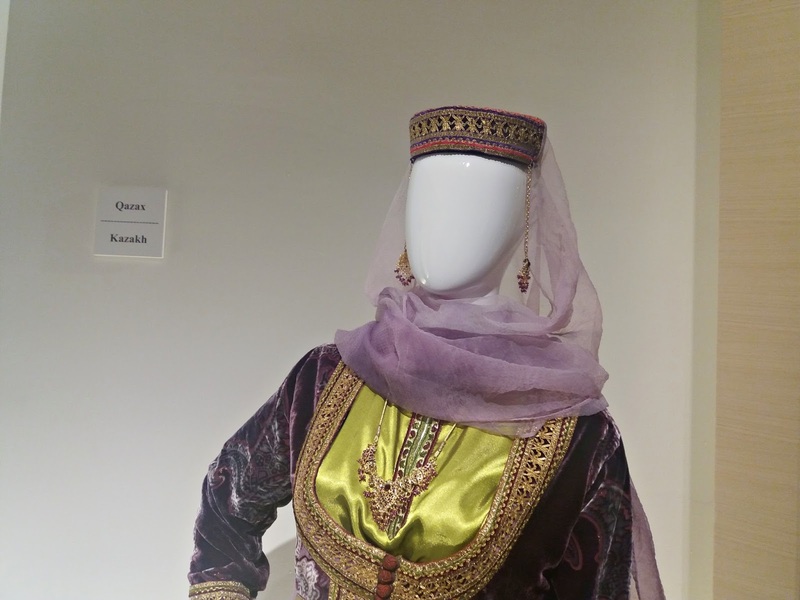 So, if you find yourself in the Caucasus, here’s what you can see in Baku. 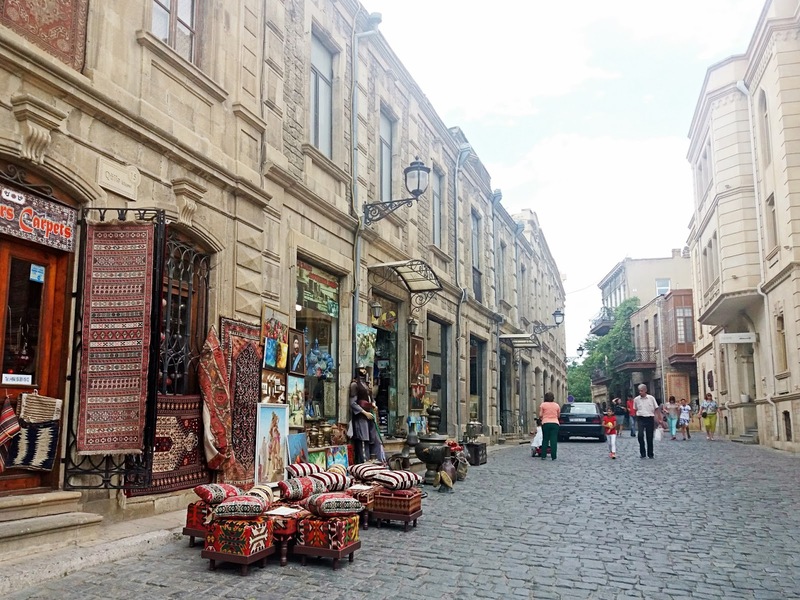 Old City, or the Inner City (Azerbaijani: İçərişəhər), is the historical center of Baku. It’s surrounded by walls and in a city with tons of shiny new buildings, it’s a great place for a touch of tradition; though I have read that many tea shops have disappeared in the past decade, which is a shame. 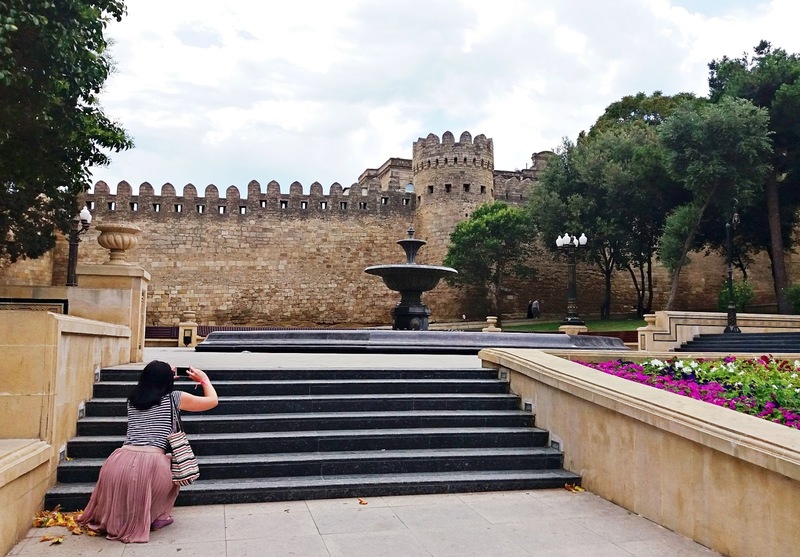 The Old City of Baku, with its Palace of the Shirvanshahs and the Maiden Tower, was the first location in Azerbaijan to be declared a World Heritage Site by UNESCO—it happened back in 2000. The Palace of the Shirvanshahs is a 15th-century palace built by the Shirvanshahs, and the Maiden Tower, dating all the way to the 12th century, is a world famous landmark of the city, mentioned in many legends and mysteries, some of which became a subject for scenario for theater plays and ballets. 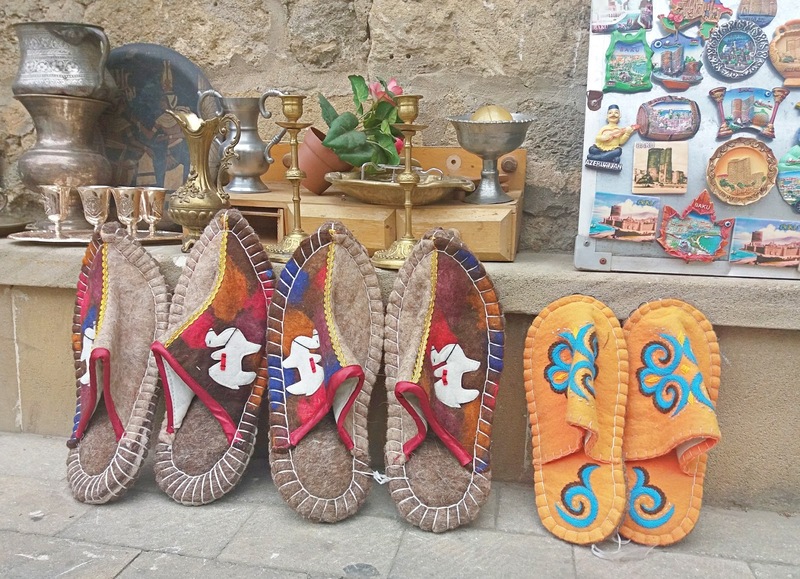 The whole Old City was build in the 12th century over earlier structures from 7th to 6th centuries BC, and the very site has been inhabited since the Paleolithic Period. Final grade: do not miss! 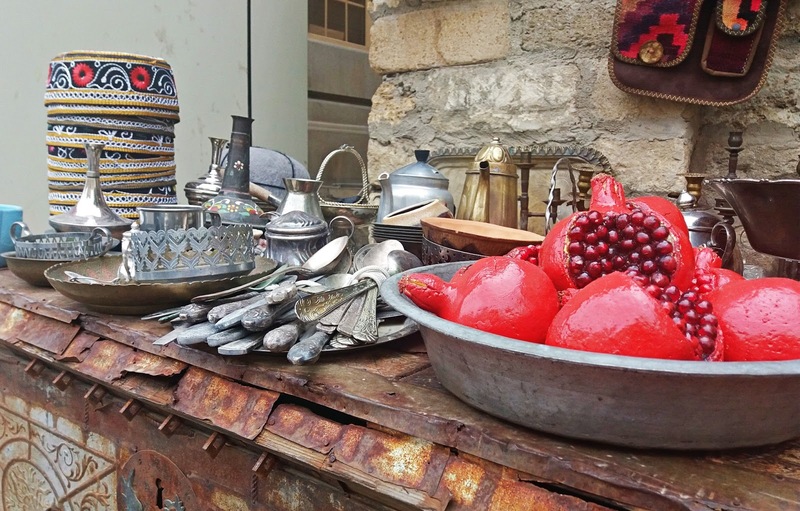 And have a glass of Azerbaijani sherbet, a drink made from fruit, herbs, sugar and water. As I mentioned before in my post on Azerbaijan, the cult of the leader is strong in this country. 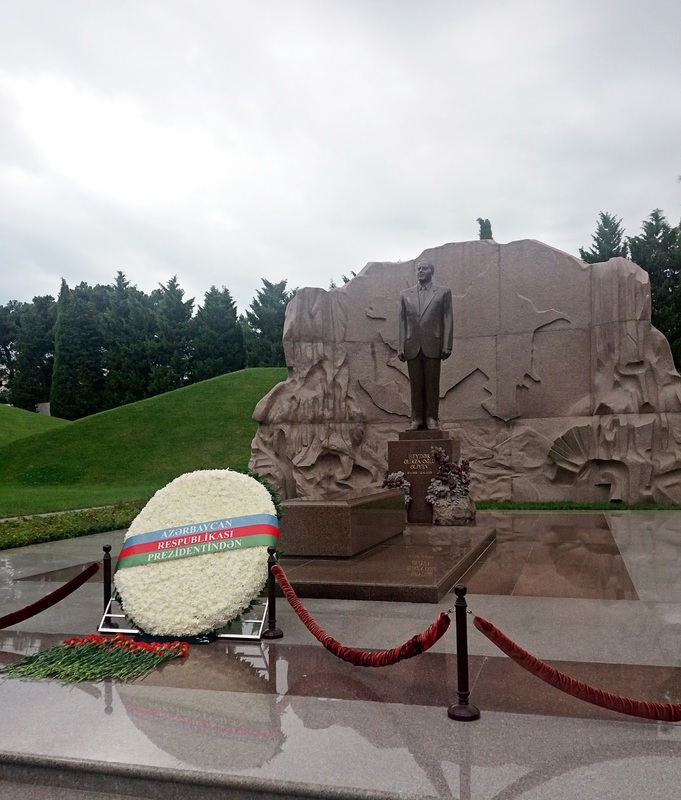 That is why we were brought to see the grave of Heydar Aliyev and leave a carnation on it. Aliyev was buried in the Alley of Honor, and there is a special man-made hill overlooking his grave. We walked along the Alley of Martyrs as well. Honestly, I like these allies. They’re usually surrounded by trees and so calm and peaceful, as your average graveyard, but with more of a feeling of a park. You don’t need to leave a carnation for the former leader, but take a stroll through this part of the city, it’s nice. Final grade: you might pass this one. Different national pretensions show themselves in full beauty at the National Flag Square. National Flag Square (Azerbaijani: Dövlət Bayrağı Meydanı) is a large city square that hosts a giant Azerbaijani flag. When I say giant, I mean giant: the flag measuring 70 by 35 metres (230 by 115 feet) flies on a pole 162 m (531 ft) high. The flagpole was a source of national pride as it was confirmed as the world's tallest by the Guinness Book of Records. However, that’s not the case anymore: the record was soon overtaken by the 165 m Dushanbe Flagpole in Tajikistan. Since there are plans to build a 120m high flagpole in Belgrade (don’t even get me started on this nonsense…), it seems there’s something about post-communist countries and giant flagpoles. Anyway! 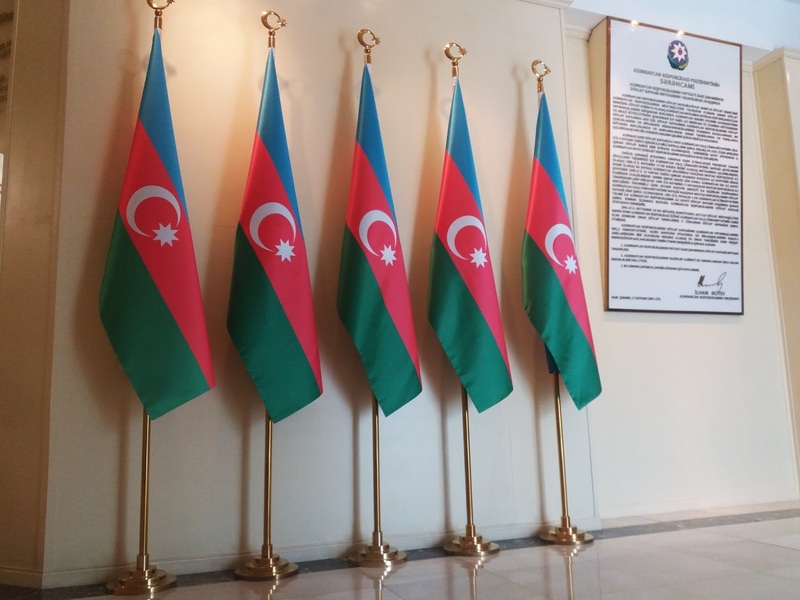 There’s the National Flag Museum in the Square, established upon Heyday Aliyev’s initiative. It’s not bad, but not one of the interesting museums in the city. 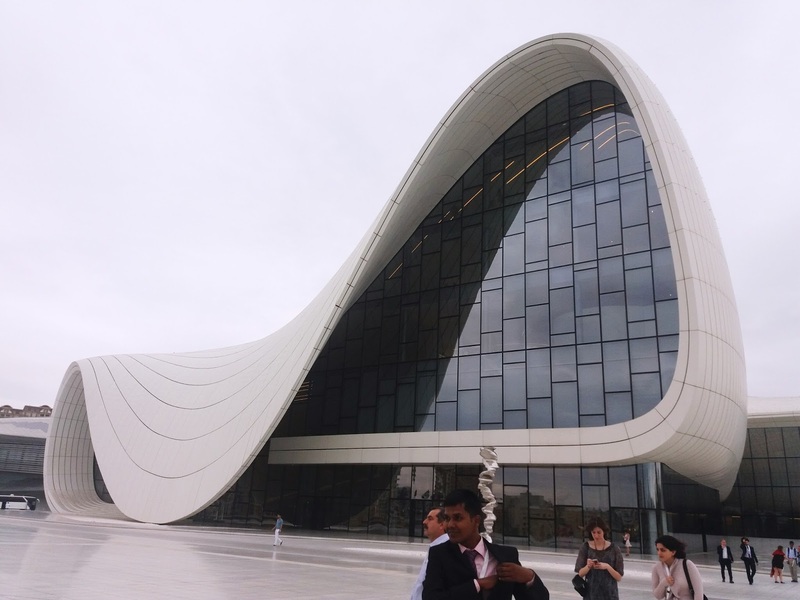 Hands-down the most beautiful building in Baku! 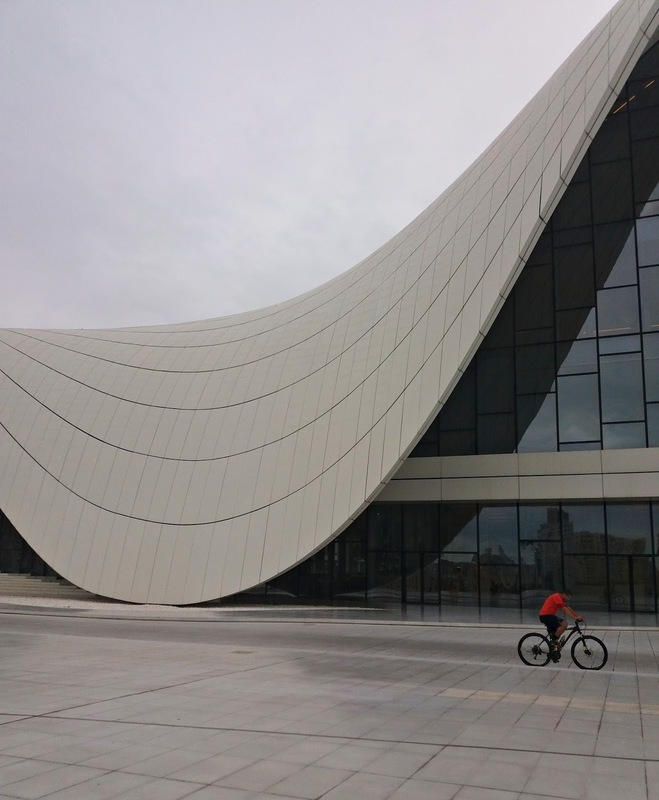 Forget the Flame Towers, it’s the Heydar Aliyev Center, beautiful white building with a wave-like shell, design by the famous Zaha Hadid, and also the Design of the Year by London's Design Museum in 2014. 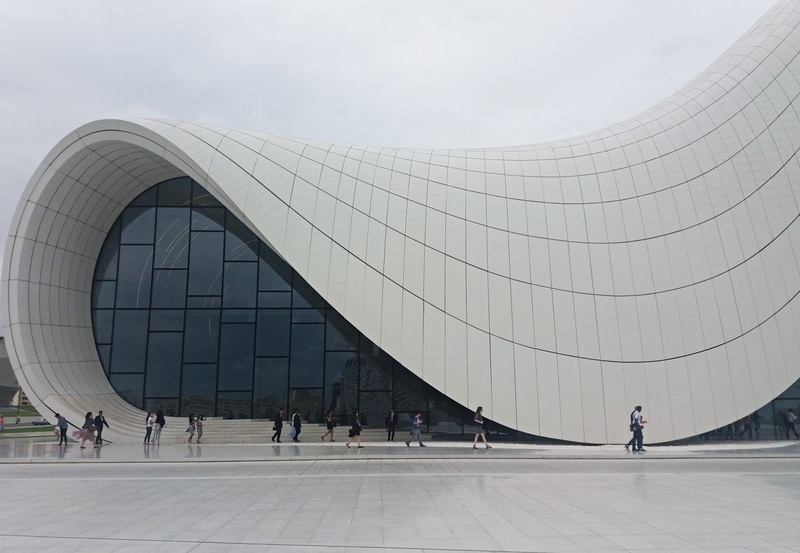 Hadid herself called the project "incredibly ambitious” during her talk at the award ceremony. The building hosts exhibition spaces, a library, a museum and concert venues. 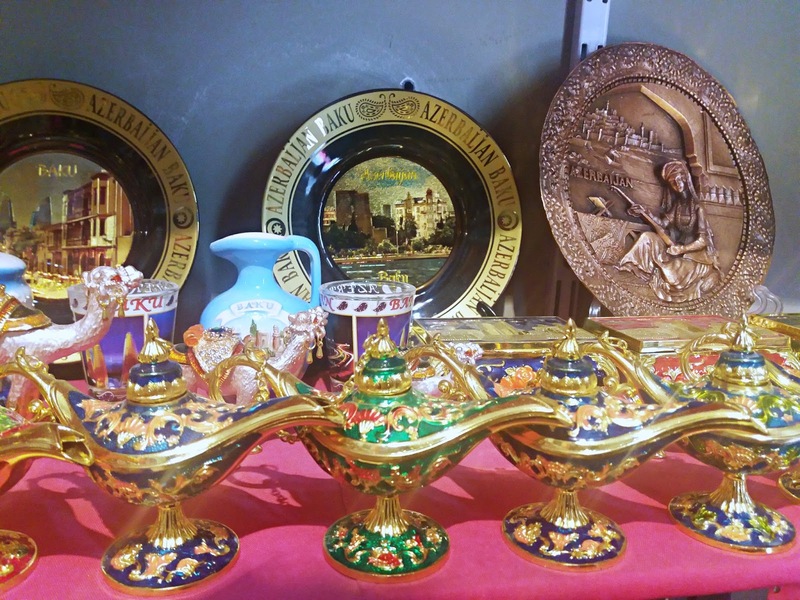 The museum is a great place for first-time visitors, as it hosts the Museum of Heydar Aliyev. 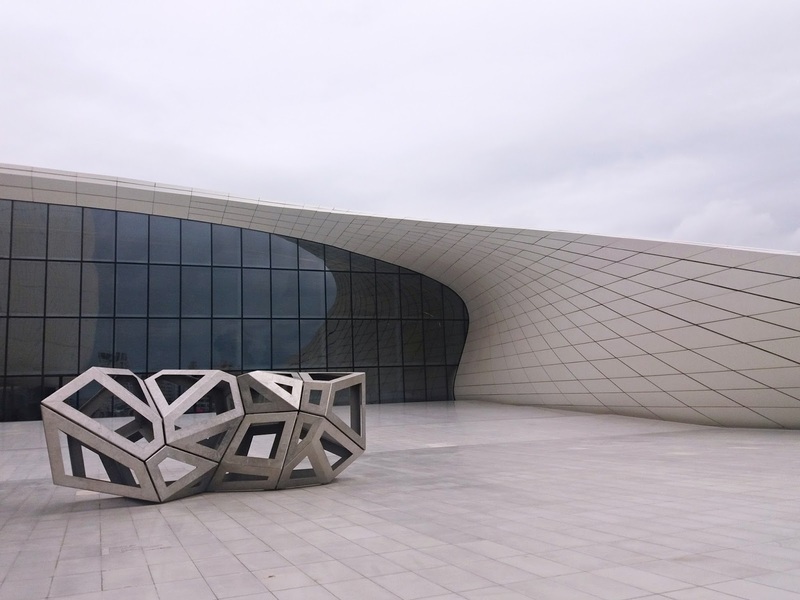 Despite the name, the museum is actually more of a national museum, exhibiting the history of Azerbaijan and, yes, different stages of the leader’s life and work. There’s a lot of interactive info—the museum is interesting and informative. 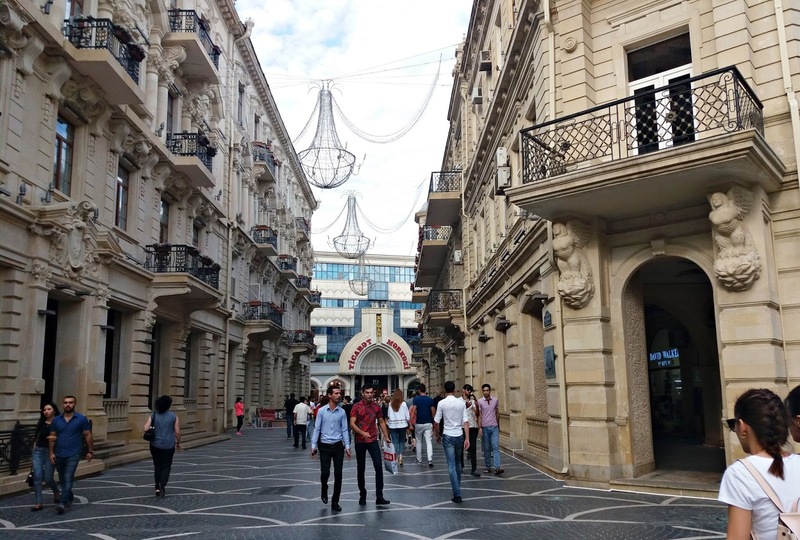 The plaza where the building is situated, close to the city center, is supposed to play a pivotal role in the redevelopment of Baku. The Azeri wanted a building that would be soft and romantic, setting them apart from the Soviet architecture and, in a way, Soviet past. I don’t know if a single building is capable of writing history, but I do know I enjoyed looking at it both from inside and outside. Truly a remarkable place! P.P.S. See that hair in my face? 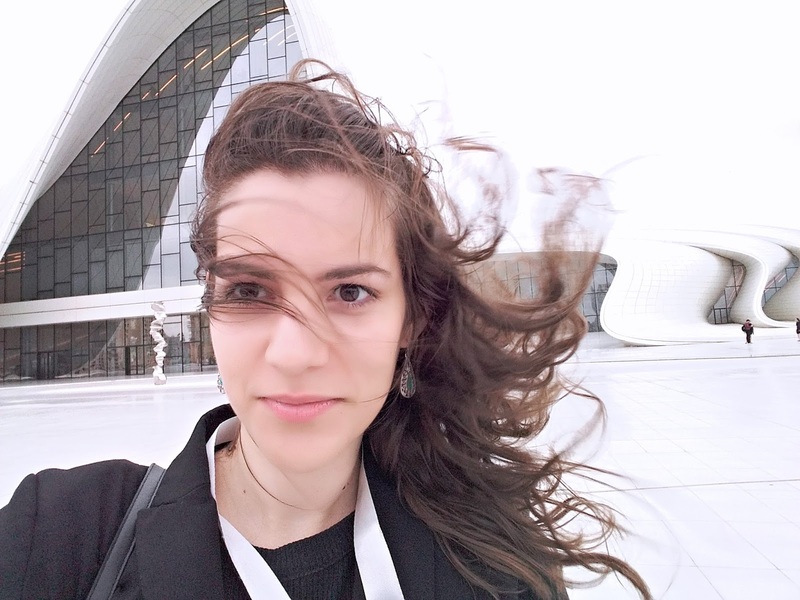 That's accurate description of the wind in Baku that is blowing all.the.time. Except when it's really hot. Then it's just hot. Address: 1 Heydar Aliyev prospekti. Tickets can be bought in the museum as well as online on the website. Final grade: do not miss! 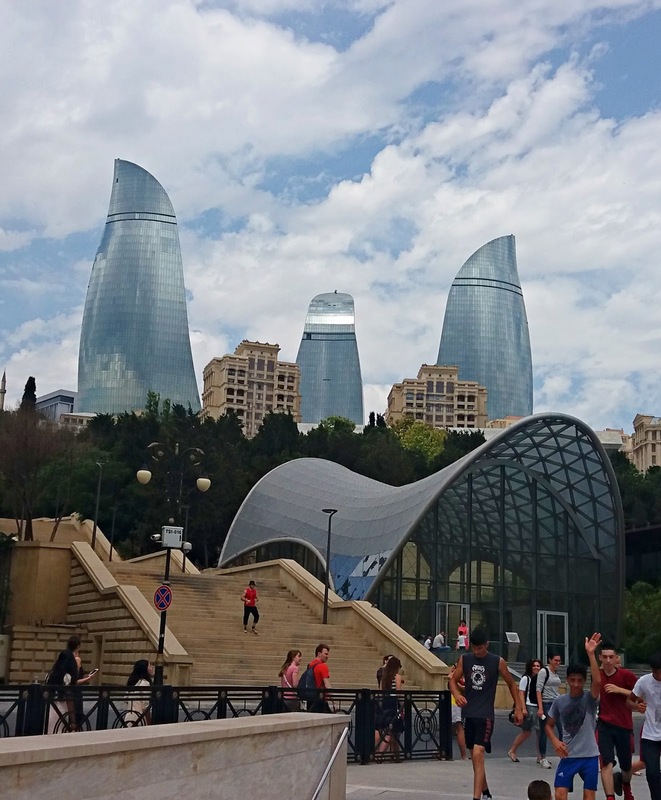 Flame Towers (Azerbaijani: Alov qüllələri) is (are? is?) the tallest skyscraper in Baku, with a height of 190 m, and it can be seen from anywhere in the city. 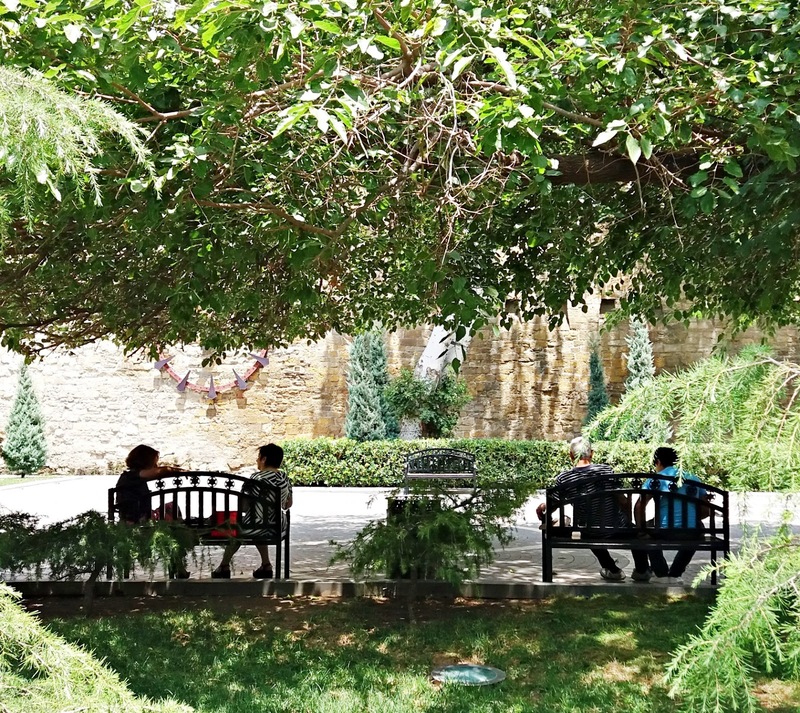 If you only saw one image of Baku taken after 2012, it has them pictured. The FT consist of three buildings: South, East and West. Their facades are covered with more than 10,000 LED luminaries, so in the evening they are a giant display screen seen, most often portraying burning flames, but sometimes other animations, such as dancing figures. You probably won’t be visiting them per se, as the buildings consist of office blocks, apartments and a hotel, but you’ll be seeing them wherever you go. I’m not suggesting you stay there—who of my blog readers has the funds for that—but you could go to a rooftop bar called 360 Bar, that offers a view over the city—the whole city, right, just as the name suggests. Baku looks really nice by night, and of course, you’ll be seeing the Flame Towers in action, all while sipping a fancy drink (that comes with a fancy price, but hey). Interesting: guess whose portrait hangs in the lobby? Why it’s Heyday Aliyev, of course! Final grade: it’s not a “don’t miss”, but definitely comes before the Alley of Honor! 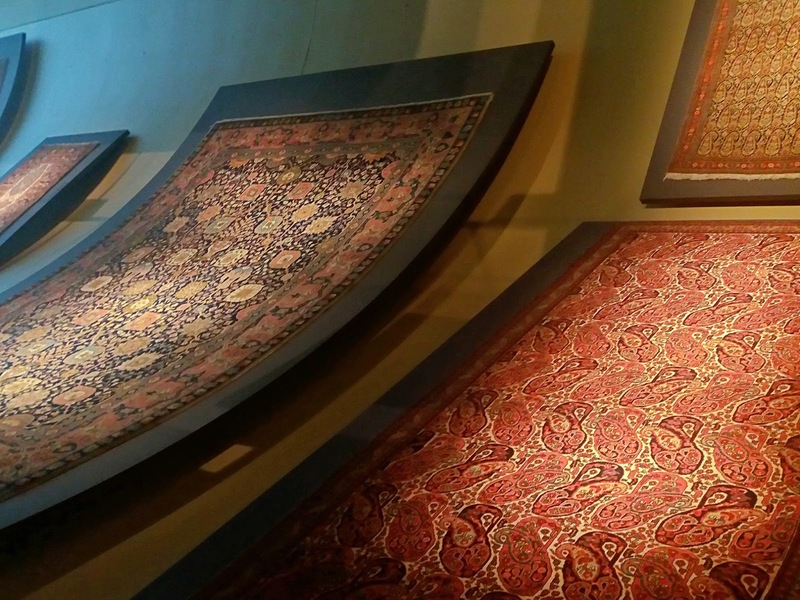 Yes, they have a carpet museum, and that’s not all! If you call right now… no, you don’t have to call, the museum will still be in a building SHAPED LIKE A CARPET. I’m not even joking. 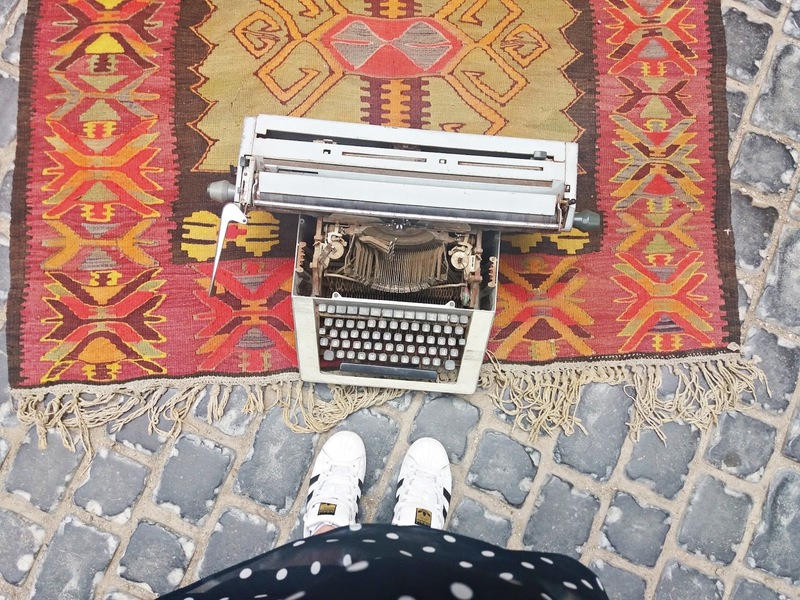 The carpet stores a rich collection of artifacts and carpets, which are said to be Azerbaijanis’ most valuable heritage. 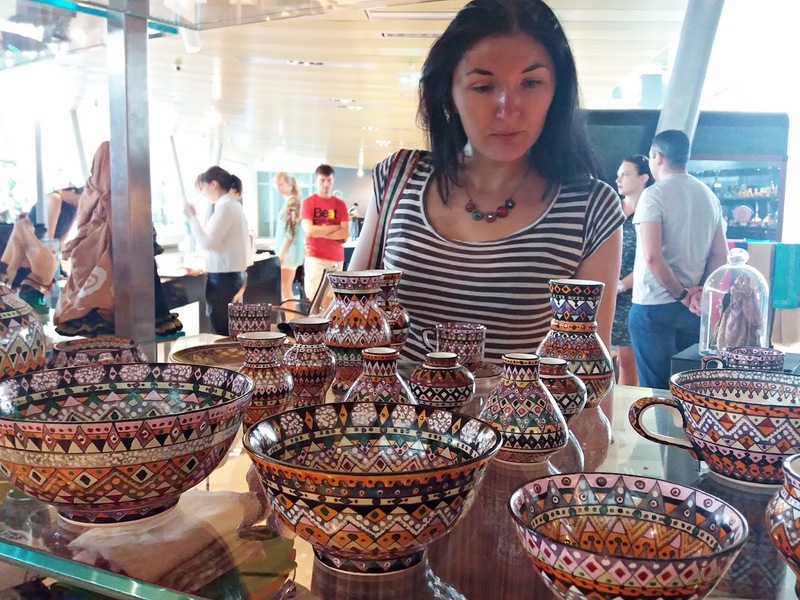 Apart from that, the museum also holds over 10,000 items of ceramics, metal works of the 14th century, jewellery from the Bronze Age, carpets and carpet items from the 17th—20th centuries, national garments and embroidery, and applied art works of the Modern Age. 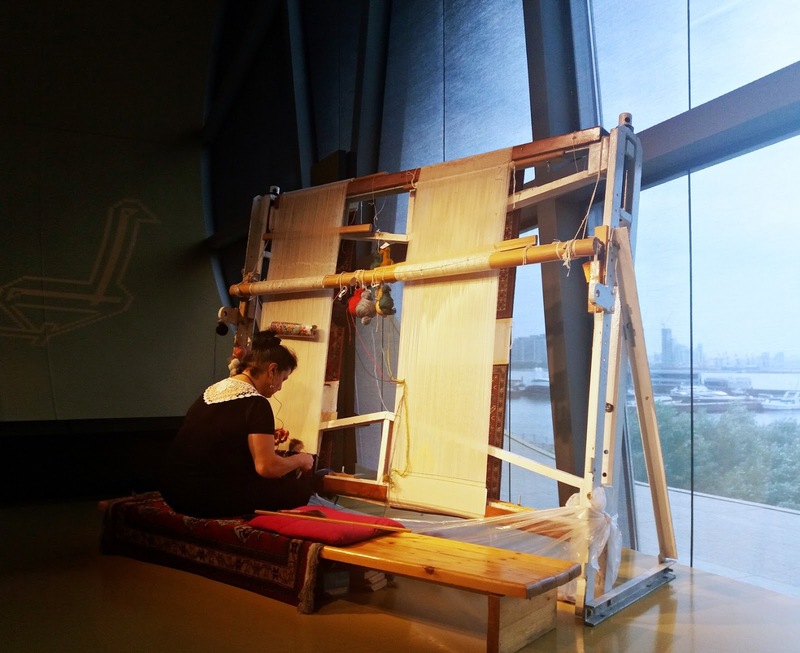 The museum is really devoted to the art and craft of carpet weaving, so it often organizes lectures and courses on carpets and other applied arts. Bonus: you can see what carpet weaving looks like in practice, as several artisans are doing so at the very museum. Final grade: don’t miss, the building is real fun, and the museum is nice. Targaryen fans will appreciate this! 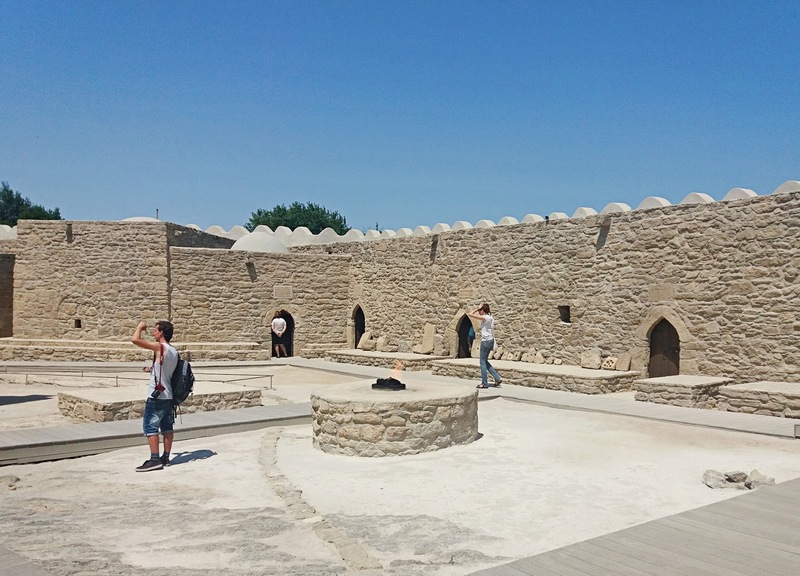 The Baku Ateshgah, or the Fire Temple of Baku, is a religious temple in the Baku suburb called Surakhani. The temple was used as a Hindu and Zoroastrian place of worship, and the word “atash” means fire in Persian (Google Translate certified). This area has long been known for burning natural gas outlets, meaning gas was coming onto the surface and would light up upon contact with oxygen. (Remember Yanar Dag?) Because of this, from a long time ago this was the holy place of Zoroastrians, who were fire worshippers (long time ago meaning approximately beginning of our era). 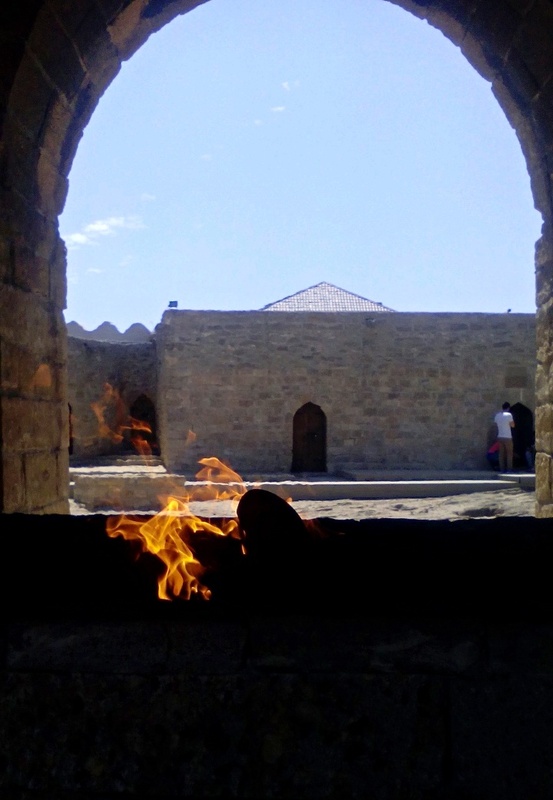 Zoroastrians attributed mystical significance to the fire that couldn’t be distinguished, much like the Lord of the Light fans in Game of Thrones. Actually, G.R.R.Martin was influenced by real-life Zoroastrianism when making up the Lord of the Light. Anyway, the Zoroastrian temple was destroyed after the introduction of Islam, which made Zoroastrians leave to India, but then Hindu fire-worshiping merchants came to the area and erected the new temple. The temple is central in the courtyard surrounded by small cells for monks, in which you can enter today and see how the monks once lived (the complex was turned into a museum). Trivia: the natural gas, so called the eternal flame, went out in 1969, so today Ateshgah is lit by gas piped from the city. Final grade: yes, visit it, it’s interesting! Address: 4 Hadji Zeynalabdin Taghiyev Str. Final grade: if you saw all the others, this one might be a handful, like it was for a lot of people in my group. Still, it’s a good museum. 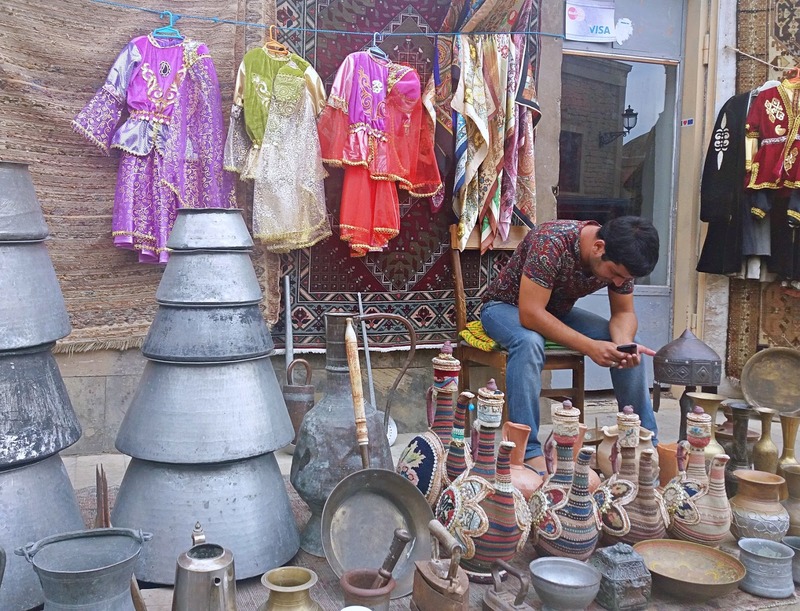 These locations not far from Baku I covered in my post Traveling in Azerbaijan, so make sure to read it too if you missed it. 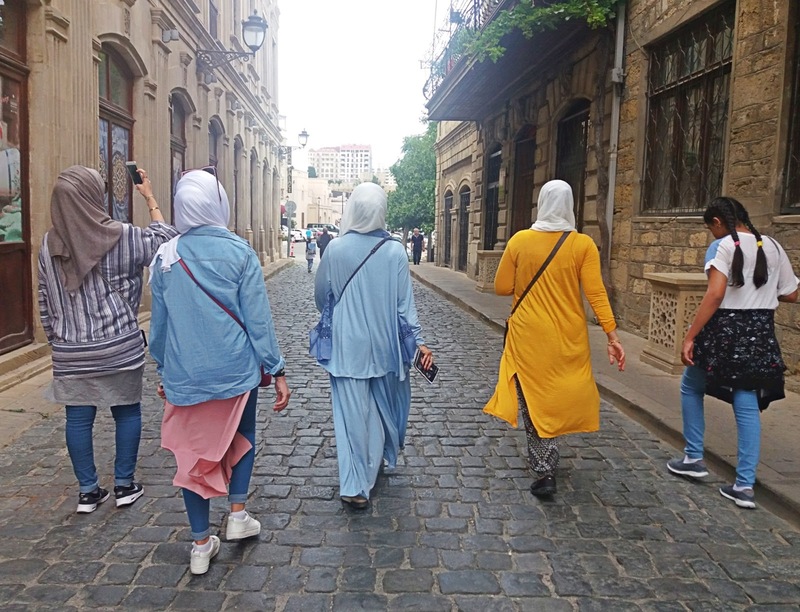 Have a lovely time in Baku, and enjoy baklava! Lovely post! What about Baku made it not your favourite? I love all the photos of shopping. Looks like they had some really awesome things to buy!